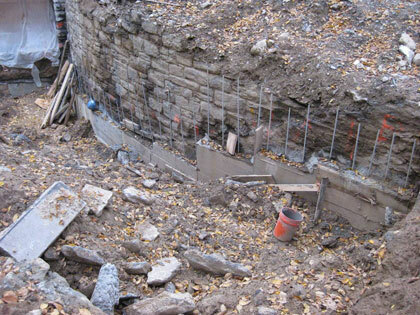 As construction continues, efforts to utilize the original schist stone entry ramp wall that was recently unearthed continue to make progress. Concrete underpinning (for an explanation of underpinning, click here) along with new steel reinforcement, will allow the original schist stone wall to be incorporated into the new entry design. Meanwhile, as the entry ramp work continues, Elemental Architecture and the team are preparing to commence full scale reconstruction efforts on portions of the main building itself. Stay tuned for continued updates from the field.